One of the benefits of CrossFit is that you have to sign up a few days in advance. Why is this so good? Because it holds me accountable to get to the gym on Monday mornings like this one, when I’d much rather stay in bed. I did take a quick peak at the website to see that we were doing ‘Tall Paul’ this morning, but I had no idea what that meant! I brushed off my car for the third morning in a row (thinking again how cool it would be if I had snow shoes) and trekked off to the gym. Confession…I stayed up a little later than usual last night watching the Superbowl and then Elementary, of course. We had so much fun at my best friend’s house eating dinner, watching football, and hanging out with her two adorable children. The appetizers were unique and delicious! This Feta Dip was a big hit. Because the BOY doesn’t like tomatoes, I only added them to half of the dip and didn’t stir everything together. I used an herb flavored feta, and the addition of Cavendar’s (one of our all time favorite seasonings) was perfect! We had a very un-football like dinner. And every single thing was flavorful and satisfying! It’s amazing how colorful this spread was! We all dug right into the food, going back for seconds. I mentioned to the BOY that we should bring in Indian food more often! The exciting thing is that we even have leftovers for lunch today. After CrossFit, I refueled with a Green Juice Smoothie (I have been craving this ginger infused drink since last week) and am about to dig into some tasty leftovers. I know compared to most, I have it easy today with a quiet day at home watching Biggest Loser, doing chores, and prepping for Friday’s trip to Florida! Oh Yea and we are going to Yogurtland! Yogurtland is having free yogurt and toppings TODAY from 4-7 pm. We’ll see you in line! Did you stay up late last night? How are you recovering today? On a large platter drizzle olive oil until you have a thin layer on the entire platter. You may use more or less here depending on your preference. 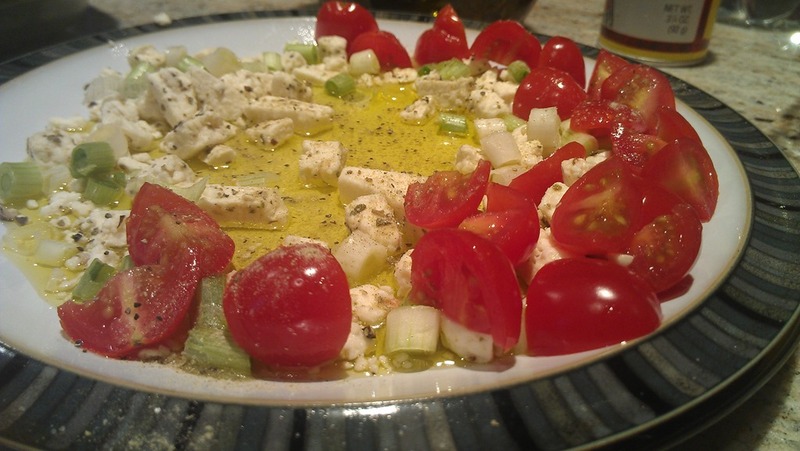 Add the tomatoes, green onions, cucumber, and feta on top of the olive oil. Sprinkle with the Greek seasoning to taste. With a spoon carefully combine the ingredients. Serve with warm sliced baguettes or pita chips for scooping up the dip. You are welcome! They just opened one by us but I know there is one in AH and Wheeling (my mom will be there). ha ha! Yum! That dip looks too good! It was awesome! Possibly a new favorite! That dip looks awesome. Good idea adding tomatoes on the side. Some of my friends don’t like tomatoes but I love them so that’s a good option! Yeah! They are ideal for a dip like this but since I knew the boy wouldn’t want them I went light on the tomatoes. This is a great and easy dip to bring to a get together for sure! that dip looks amazing! i still havent tried crossfit i really gotta get on that! indian spread?! right up my alley, looks soo good! i stayed up late for superbowl last night too but passed out the second i got home and just slept alittle later today thank god! I was amazed at home good the Indian food was reheated today too. Yummy! It is always so nice to sleep in a little bit on Mondays after a busy weekend! CrossFit is fun. Since I’ve been going a few weeks now I am getting to know the other people and they are really friendly which I like! Aww those kids are too cute! And that salad is genius- love it! I’m obsessed with *anything* involving feta cheese! I will have to try this dip sometime, seems pretty simple, which I love! Also, I’m jealous you get to enjoy free yogurtland today — we don’t have one here! It just opened a few weeks ago and so we were super excited to go back and I loved having FroYo for dinner : ) They really do have great tasting flavors. This dip was super easy and you can just prechop everything and then put it together where you’re going so it is great to bring as an appetizer to a friends. Enjoy! I love the look and sound of this dip. I adore Greek flavors…Indian too. I stayed up far too late last night, but it was well worth it. Agreed! I am definitely on my way to bed now to make up for it. Ha ha! Enjoy the dip. You could probably add some of your CSA produce to the dip too! I didn’t stay up any later than usual. So happy to have a TiVo to record Elementary for me! I about died of boredom in the second half, but the good news is I’m almost done with Gone Girl! That is good news! What do you think? The movie is coming soon! MMMM!! I love feta! That dip looks awesome! It is so good! The olive oil and feta go great together. It makes me ready for summer and grilled feta! Grilled feta!?! Do tell me more please!! That sounds awesome!! I have it somewhere on the blog, but you take a block of feta…cover it in olive oil and thyme, and then grill for ~16 minutes. Eat warm off the grill with pita chips! It’s AMAZING! Thanks! I am definitely going to have to try that!! Sounds awesome!